Russian author; born at Minsk 1835; died at St. Petersburg 1888. 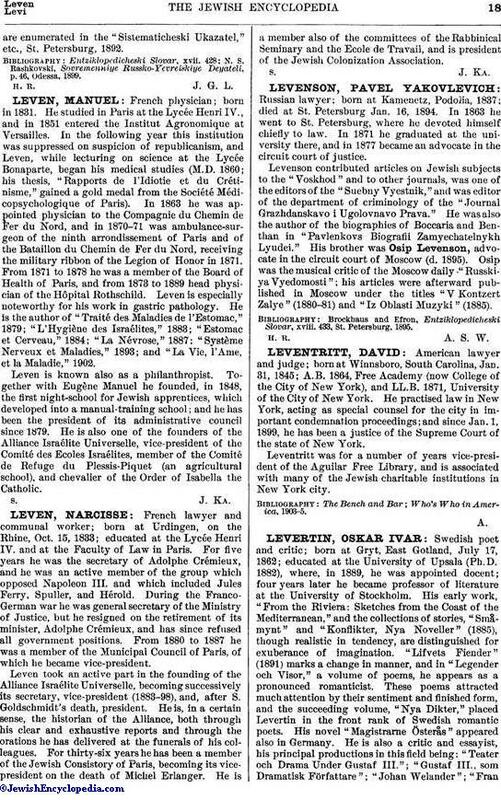 Levanda graduated from the rabbinical school in Wilna in 1854; was appointed instructor in the government school of his native town; and held the position of adviser on Jewish affairs ("learned Jew") to the governor-general of Wilna. He began his literary career early in life. In the fifties he was a contributor to the "Minskiya Gubernskiya Vyedomosti"; in 1860 he published in "Razsvyet," edited by Osip Rabinovitch, his "Depo Bakaleinyikh Tovarov"; in 1861 he began to publish in "Sion" his "Drug Bernar. " He contributed to many periodicals, among them "Vilenskiya Gubernskiya Vyedomosti," of which he was the editor; "St. Peterburgskiya Vyedomosti"; and "Vilenski Vyestnik." In the last-named appeared his story "Samuel Gimpels." In 1876 he published a collection of sketches under the title "Ocherki Proshlavo," followed later by a number of stories, such as "Chetyre Guvernera," "Lyubitelski Spektakl," "Iz Dobravo Staravo Vryemeni," etc., in "Russki Yevrei," "Yevreiskoe Obozrenie," and "Voskhod." In 1876, also, he took active part in the publication of Landau's "Yevreiskaya Biblioteka." To this period belong his "Goryacheye Vryemya," "Gnyev i Milost Magnata," and "Avraam Yosefovich." In the eighties Levanda continued his literary activities with great zeal, publishing many letters and articles bearing on the Jewish question, besides two novels, "Ispovyed Dyeltza" and "Bolshoi Remiz," and other stories in "Nedyelya" and elsewhere. 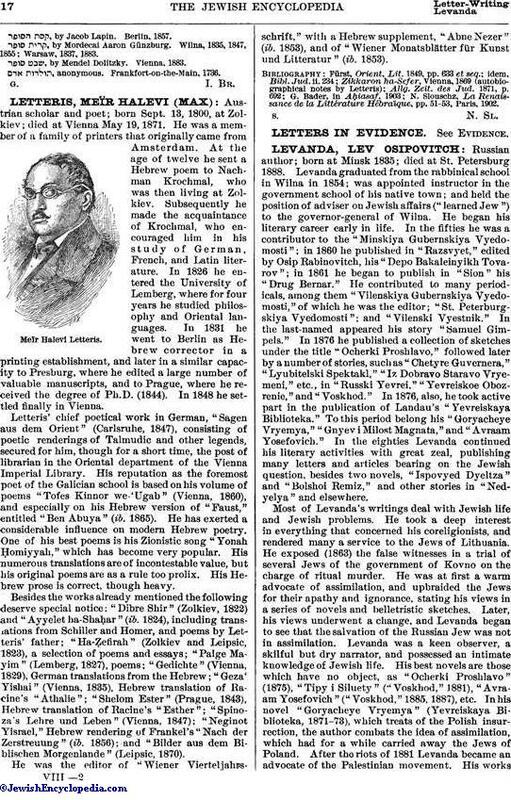 Most of Levanda's writings deal with Jewish life and Jewish problems. He took a deep interest in everything that concerned his coreligionists, and rendered many a service to the Jews of Lithuania. He exposed (1863) the false witnesses in a trial of several Jews of the government of Kovno on the charge of ritual murder. He was at first a warm advocate of assimilation, and upbraided the Jews for their apathy and ignorance, stating his views in a series of novels and belletristic sketches. Later, his views underwent a change, and Levanda began to see that the salvation of the Russian Jew was not in assimilation. Levanda was a keen observer, a skilful but dry narrator, and possessed an intimate knowledge of Jewish life. His best novels are those which have no object, as "Ocherki Proshlavo" (1875), "Tipy i Siluety" ("Voskhod," 1881), "Avraam Yosefovich" ("Voskhod," 1885, 1887), etc. In his novel "Goryacheye Vryemya" (Yevreiskaya Biblioteka, 1871-73), which treats of the Polish insurrection, the author combats the idea of assimilation, which had for a while carried away the Jews of Poland. After the riots of 1881 Levanda became an advocate of the Palestinian movement. His worksare enumerated in the "Sistematicheski Ukazatel," etc., St. Petersburg, 1892. N. S. Rashkovski, Sovremenniye Russko-Yevreiskiye Deyateli, p. 46, Odessa, 1899.